I write to you on this Divine Mercy Sunday with the happy news that Pope Francis formally announces today a “Holy Year of Mercy” to begin on 8 December 2015 under the patronage of Mary, the Mother of Mercy. The message of mercy has been central to Pope Francis’s pontificate, as it was to that of Saint John Paul II, who inaugurated this Sunday after Easter as Mercy Sunday and who canonised the Polish visionary of God’s mercy, Saint Faustina Kowalska. As we prepare for this Holy Year, it is important to remember God’s mercy is his unfailing attitude and actions towards the least deserving, and especially the spiritually poor. Mercy never abandons us in the misery of our sins by pretending sin doesn’t matter. This is not the mercy of God. We may easily give up on each other and believe ourselves incapable of the call to holiness; but God never ceases to call us and to offer us his grace, which is “the free and undeserved help that God gives to those who respond to his call” (CCC 1996). In the Gospel we see how Christ does not give up on Saint Thomas, despite all his refusals to accept Divine mercy (cf Jn 20:19-31). Likewise, Our Lord will never cease to call each of us to rise again from wherever sin has brought us down. Our Christian life begins with an act of mercy, an act of rescue in baptism. And this work of rescue becomes the pattern of our life in Christ. Since our Christian lives are always lived at a crossroads, the Catechism states: “There are two ways: the one of life, the other of death” (CCC 1696). In the readings at Mass today Saint John tells us that loving God is keeping his commandments, “and his commandments are not difficult, because anyone who has been begotten by God has already overcome the world; this is the victory over the world – our faith” (1 Jn 5:3-4). The Church always puts before us the distinction between the way of Christ leading to life and the false path which leads to death. However, God’s mercy does not abandon us even if we follow the lure of the false path. His mercy goes before us; it also follows us, as Saint Augustine taught. This call is compared in the Catechism to “Jesus’ look of infinite mercy” that “drew tears of repentance from Peter”. 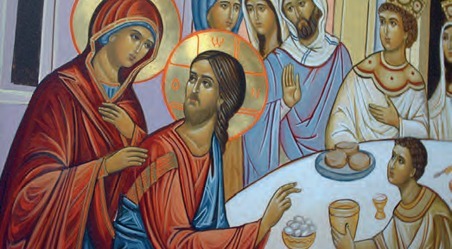 It is this gaze of love that leads each of us through a process of “uninterrupted” conversion as God makes our hearts new (see CCC 1428-1432). 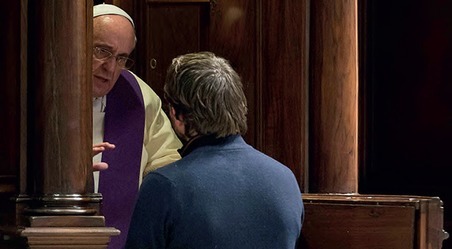 The sacrament of penance and reconciliation entrusted to the Church on Easter day is the merciful means by which we continue to choose life and bring all of our unruly thoughts, words and actions into conformity with Christ. We must give thanks today for this great Sacrament of Mercy!